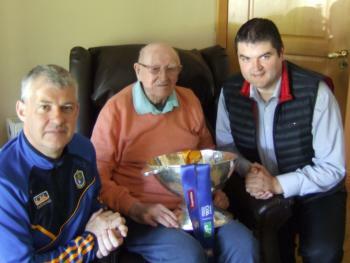 Liam Gilmartin of the legendary Roscommon 1943 and 1944 All Ireland Senior football champions passed away after an illness. Liam captained the first Roscommon team to win an All-Ireland minor title in 1939, and later celebrated twice as a senior champion, forming a winning centre-field partnership with Eamon Boland. Liam is also believed to have been the oldest man in Ireland with an All Ireland senior football medal. Originally from Ballymurray on the outskirts of Knockcroghery Liam Gilmartin spent the last 75 years of his life in Dublin. Liam Gilmartin was one of the best midfielders Jamesie Murray observed in action and Donal Keenan, another celebrated member of those Roscommon teams of the 1940’s, would later state that Roscommon would have won a third All-Ireland in 1946 had he been fit to play. By then Liam had been forced to retire from the game at just 23 after contracting TB shortly after joining An Garda Siochana in Dublin. His last match was an exhibition game in Corrigan Park, Belfast for the reigning All-Ireland champions (Roscommon) against a combined Leinster/Ulster selection, not that he knew it at the time. On Friday the 1st of June 2018, the only living member of the Roscommon Senior football team that won the All Ireland in 1943 & 44, Liam Gilmartin celebrated his 97th birthday. To mark the occasion Roscommon GAA Co. Secretary Brian Carroll and Roscommon Senior football team manager Kevin McStay called to his home in Raheny in North Dublin and brought with them the Nestor Cup, Div 2 League cup and the Connacht FBD cup.